Cuddle Cots are cooling bassinets that allow parents to spend more time with newborns that are stillborn or have died soon after birth. Jamie and Andy Stewart mourn the loss of their son, Logan. He lived for 54 minutes after being born with a fatal disease. Photo by Ken Papaleo. Jamie Stewart’s baby lived for just 54 minutes, but every second was precious. “We got the chance to feel his warmth,” said Stewart. “He wiggled his shoulders. He was beautiful. Logan Stewart lived for just 54 minutes, but every second was precious. Photo by Ken Papaleo. 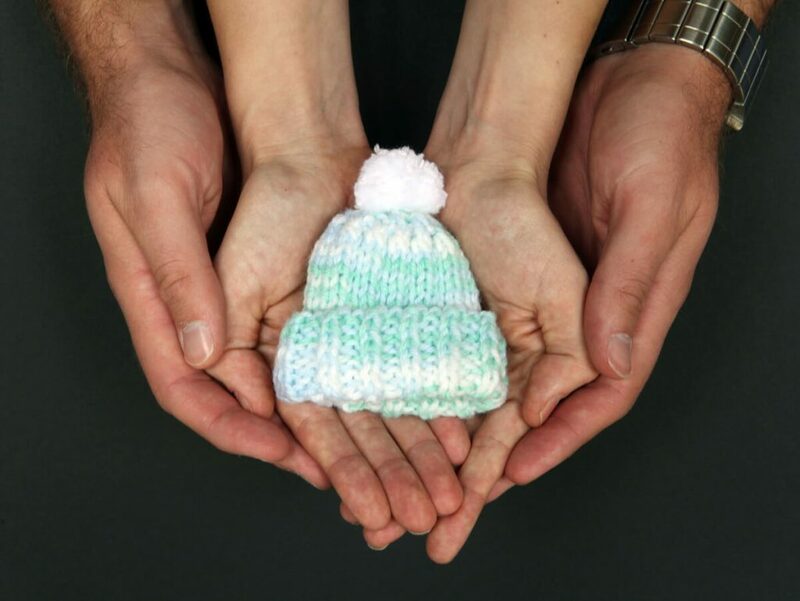 Stewart and her husband, Andy, went in for a routine ultrasound when she was 20 weeks pregnant They were thrilled to find out whether they were having a boy or a girl. They learned their baby was a boy and they planned to name him Logan. But devastating news came as well. Their baby had a fatal disease called osteogenesis imperfecta or OI Type 2. It’s also known as brittle bone disease and Logan would almost certainly die in utero or soon after birth. The excitement of having their first child soon turned to sorrow. Still, the Stewarts were determined to create happy memories as Jamie’s belly grew. “We would dance with him in the kitchen and we went to Rockies games,” she said. They prayed for a miracle, but prepared for their son’s death. Jamie and Andy Stewart cradle their son, Logan’s, newborn hat. Photo by Ken Papaleo. At 27 weeks, Stewart’s water broke and her doctors sent her to UCHealth University of Colorado Hospital since her pregnancy was deemed high risk. Logan arrived on Aug. 9 of 2012. The Stewarts weren’t sure Logan would survive the birth, but he did. 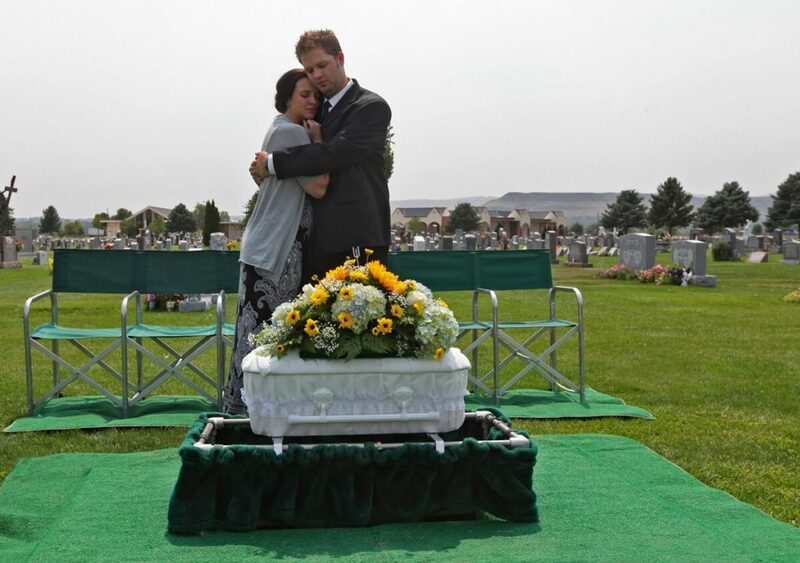 They cuddled with him as long as possible and took photos to honor and remember their son. While they received excellent support from family, friends and their church community, the Stewarts yearned for help from other parents who had been through the unimaginable grief of losing a baby. To create the support network they wish they could have had, the Stewarts and Jamie’s sister, Kelly Kuhn, created a non-profit called Walk With Me in 2015. Memorial trees so families have a living memory of a baby who has died. Stewart recently returned for the first time to the hospital where Logan was born to provide another gift for grieving parents. Women who started a non-profit called Walk With Me gave a Cuddle Cot to UCHealth University of Colorado Hospital. Photo by UCHealth. 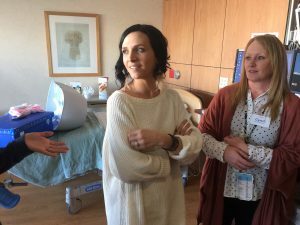 She, her sister and Walk With Me family advocate, Amber Chardavoyne, gave University of Colorado Hospital a special cooling bassinet called a Cuddle Cot. A baby’s body can decompose quickly after death, reducing the amount of time parents can spend with their infant. The Cuddle Cot pumps cold water through coils in pads that cool the body and preserve it longer to give parents more time. The Cuddle Cot’s manufacturers in the U.K. says studies show that families can handle infant loss better if they are able to spend more time with their baby and begin to grieve. Aubrey Becker, prenatal loss coordinator for University of Colorado Hospital, teared up when the women delivered the Cuddle Cot. She said it will be incredibly valuable for families who lose babies. Typically, parents spend about 24 to 72 hours in the hospital after a birth. In the past, when an infant died, at a certain point, the caregivers had to take the baby’s body to the morgue. Now, the Cuddle Cot will allow families to spend as much time as they wish with their infant. Jamie Stewart lost her son to a fatal disease. She started a non-profit called Walk With Me to help other grieving families and recently gave a Cuddle Cot to UCHealth University of Colorado Hospital. Photo by UCHealth. “It’s a beautiful gift,” Becker said. 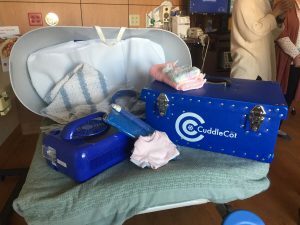 Cuddle Cots cost about $3,000 each and Walk With Me hopes to provide one for every hospital in Colorado. The gift to University of Colorado marked the third in Colorado for Walk With Me. Like Stewart, Chardavoyne also lost a son. Mason was born on Jan. 7, 2009 and lived for five days. He had a chromosomal condition called Trisomy 18. Chardavoyne has two other sons, Jaxon, 11 and Carson, 9, and feels a strong pull to help other families who have lost infants. “I hope I can inspire them to find purpose in their pain,” Chardavoyne said. While supporters rally after the death of a baby, life soon goes on for most people; meanwhile, the losses keep mounting for grieving families. Birthdays and other milestones can be especially hard. “It’s really hard to celebrate a birthday without the birthday boy,” said Stewart, who now has two other children, a 5-year-old boy named Sullivan and a 3-year-old girl named Emersyn. Continuing to honor the children they lost while helping others has helped Stewart and Chardavoyne heal. The motto for Walk With Me is “choose hope.” Photo by UCHealth. 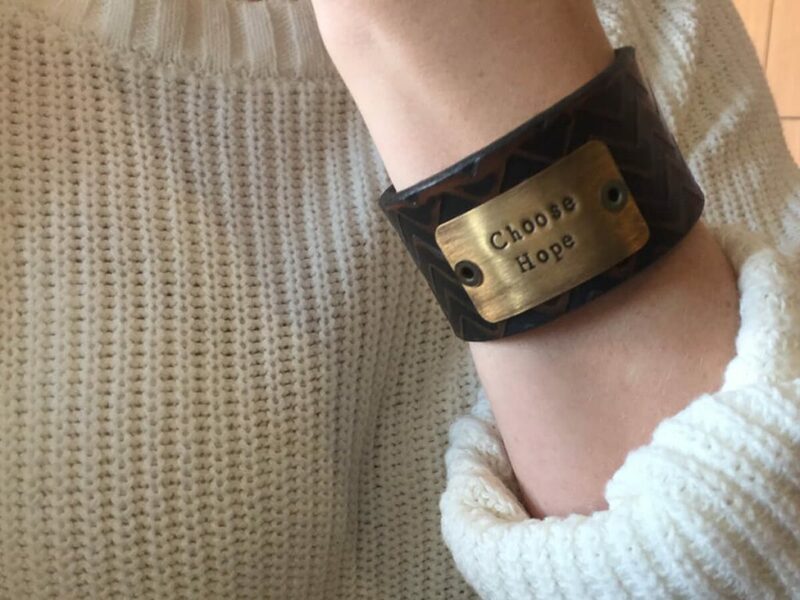 Stewart, Chardavoyne and Kuhn all wear bracelets with those words etched in them. “Losing a baby is one of the most tragic situations that can happen in life. When you have a sick or dying child, you are unable to protect them. You are losing a piece of your heart,” Stewart said.